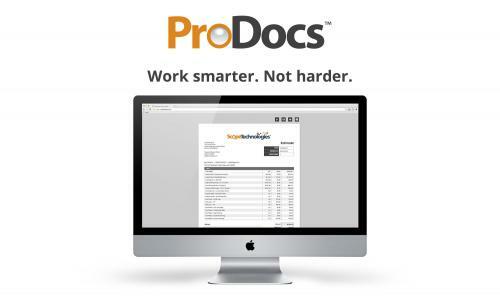 DENVER, Feb. 9, 2016 /PRNewswire/ -- ProDocs™ is the new tool from Scope Technologies that makes generating estimates easier for the Contractor. With a few clicks, users can see their Scope measurement reports converted into an estimate, ready to hand off to their clients, making sales calls more professional, accurate and easier for their clients to understand. Jerod Raisch, CEO of Scope Technologies stated, "ProDocs is the most robust and versatile estimating tool out there, built with highly customizable options and adaptability — to be what the contractor needs, when they need it. It's designed to save contractors time and money, offered as a value-added service with minimal commitment. ProDocs really demonstrates how Scope Technologies is stepping up its game in technology and in service." “When I use a RoofScope report and ProDocs together, I spend less time at job sites and punching in numbers. It literally saves me hours in a day and days in a week. But the nicest part about it is honestly that I don’t have to spend time thinking about it. It’s like having a paid assistant every time I hit the ‘Generate [ProDocs]’ button”. With ProDocs in their tool belts, contractors can generate more estimates in a day, leaving time to close sales, secure bids and focus on growing business. Check out the new ProDocs estimator tool! Streamlining the measuring and estimating process, Scope Technologies delivers a suite of measurement reports and services for the contractor, architect, engineer, and insurance adjuster. Using aerial imagery and the latest software, we create highly detailed and accurate reports compiling all essential measurements and images into an easy-to-read, environmentally friendly report. Along with its flagship brand, RoofScope®, we offer takeoff reports for Gutters, Siding, Paint, Insulation, and Concrete, as well as providing reports from Blueprints.